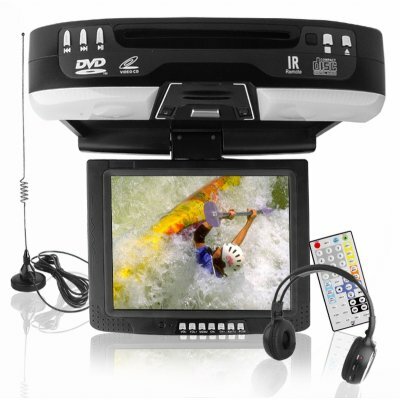 Successfully Added Roof-Mounted 10.4 Inch TFT-LCD Monitor + DVD Player -Black to your Shopping Cart. 10.4 Inch roof-mounted in car TFT LCD monitor with a built in DVD player for big screen fun as you are traveling on the road. A incredible luxury item for any car, this entertainment system also comes with a USB port and SD card reader for playing digital media such as MP3/4 files and pictures, an analog TV tuner and an included TV antenna, has 2 on/off dome lights for lighting up the monitor when it is dark, has an FM transmitter for playing sound on your own cars sound system without the bother of wires, has 2 AV OUT and a VGA OUT for connecting to various monitors, and even comes with a high quality foldable IR headphone for listening to signals transmitted by the IR transmitter. This is a car ceiling monitor dvd player sure to please, direct from China to you at astonishing wholesale discounts. OSD Languages- English, German, French, Spanish, Portuguese，Chinese （Simplified）， Chinese(Traditional), Russian, Italian. View angle is not so great as the MSI Wind U100 netbook, but you can turn the screen all possible ways. and the distance from the back seat of the car to the roof monitor is sufficient, you're not walking in your car :). What is a nice feature aswell is that you can change the display direction, upsite down, mirrored etc. Very good for testing it on a table.